Collaborators’ Q&A: Poet Emma Sovich: This may sound strange, but I never really thought of this as a domestic or nostalgic poem until it got paired with this art. 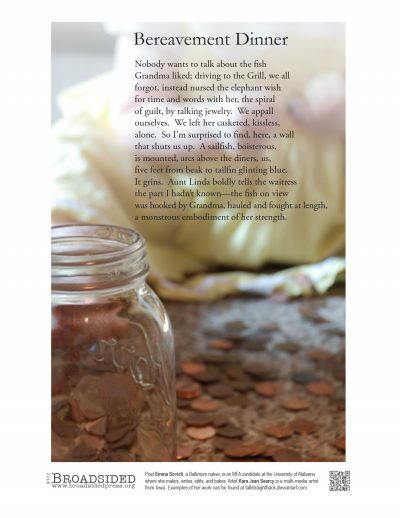 Artist Kara Searcy: I was surprised by how the photograph seemed to take on a kind of hopefulness which was contrasted by the melancholy mood the poem initially starts out with. Poet Emma Sovich, a Baltimore native, edits Black Warrior Review and is an MFA candidate at the University of Alabama. Artist Kara Searcy is a multi-media artist from Iowa.